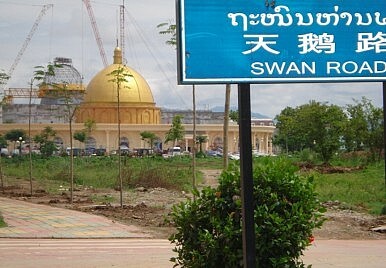 A large golden dome dominates the Laotian landscape on the other side of the Mekong River. From Chiang Saen, the ancient capital of the Lanna kingdom and now a Thai port, visitors board boats at a landing stage built by a Chinese trading company. Every 15 minutes, visitors are picked up by fast launches and whisked across the river. Landing on the Laotian side, they’re ushered into a pompous domed edifice emblazoned with Chinese dragons on the stairway that houses the immigration arrival hall in the casino zone of Ton Pheung in Laos’ Bokeo Province. Welcome to the Golden Triangle’s glittering new gambling city, dubbed the new ‘Macau on the Mekong’. Yet getting to stamp a 14-day free entry stamp into visitors’ passports is about the only remaining semblance of authority still exercised by the host Laotian government in this Chinese-run Special Economic Zone (SEZ). Along the waterfront, high-powered boats disgorge Chinese businessmen, investors, gamblers and tourists. Some have made their way here not through the popular route via neighbouring Thailand, but directly from Yunnan Province in China, while others arrive by land along the vastly improved road from the Chinese border at Boten. A group of Chinese investors are trying to transform the Golden Triangle’s traditional image as a mecca of the international heroin trade to a ‘Macau on the Mekong’ by luring gamblers, tourists and traders. When the complex is completed at the end of next year, it will boast two golf courses, karaoke bars, massage parlours, swimming pools, hotels, a clinic and shopping centre. But it’s no accident that the first building in place is the casino. After all, gambling is illegal in both Thailand and China. The first phase of construction, which includes a road to the nearest town of Ban Houei Xay, will cost between $200 million and $300 million. The total undertaking, meanwhile, is expected to cost about $2.25 billion dollars, with over 50 projects to be completed by 2020.